Mike Budenholzer's fingerprints are all over the Milwaukee Bucks' transformation into an NBA title contender. The team's turnaround is the result of a series of deliberate improvements in three key areas: 3-point shooting, defensive efficiency and rebounding. The year-over-year stats in each of these areas are nuts. On their own, they make Budenholzer a candidate to win the NBA's Coach of the Year award. Combined with the Bucks' 52-17 record, the best in the NBA, they should make him a lock. Let's start with 3-point shooting. Year-over-year stat No. 1: Last season, the Bucks ranked 27th in made 3s per game (8.8). This season they rank second at 13.3, meaning they're scoring 13.5 more points per game from downtown. That sudden influx is driven by Budenholzer's spacey offensive architecture and green-lighting virtually every player on the team. Last season, no player on the Bucks averaged more than five 3-point tries per contest. This season they have three -- Khris Middleton, Brook Lopez and Nikola Mirotic -- averaging six or more. 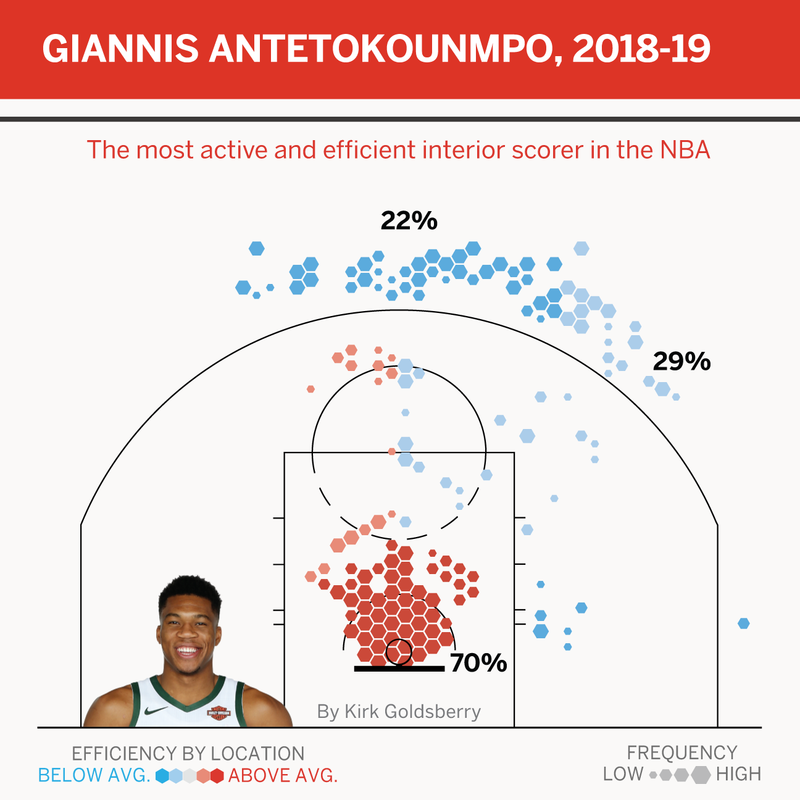 But in a weird way, the Bucks' proficiency from downtown starts with Giannis Antetokounmpo, who has become the NBA's most terrifying interior threat. By pressuring the rim, he collapses the shape of the opposing defense. Lopez's transformation is nothing short of amazing. He played six full seasons in the NBA and became an All-Star center without making one regular-season 3-point shot. It wasn't until Jan. 10, 2015, that Lopez made his first career 3 (at age 26). Perhaps no player in NBA history has exhibited a more dramatic change in shot selection over this short time frame. It has been a truly remarkable metamorphosis that says just as much about the state of the NBA as it does about Lopez. He deserves a massive amount of credit for reinventing his entire offensive game in the middle of his prime. He is the epitome of the NBA's outward migration of the big man. The 3-point activity of centers is up 500 percent this decade, which is incredible, but it's telling that Lopez's is up way more than that. Year-over-year stat No. 2: Last season, Milwaukee's defensive efficiency ranked 18th in the NBA; this season it's first. Budenholzer rearranged the team's defensive principles. They are much less aggressive at the point of attack. Only the Orlando Magic switch fewer picks per 100 possessions this season than the Bucks (4.2), according to Second Spectrum tracking. In 2017-18, Milwaukee had the ninth-most switches with 13.3 per 100. Year-over-year stat No. 3: Last season, no team gave up more buckets at the rim than the Bucks, whose opponents racked up 19.5 field goals per game in the restricted area. Incredibly, they've gone from 30th to first in this category, allowing just 14.8. Teams know it's a disaster zone inside, so they're hardly even trying. Milwaukee opponents are expected to shoot only 63 percent at the rim, the worst shot quality in the league for that area, per Second Spectrum. And Bucks opponents get to the rim for a league-low 15.3 shots per 100 possessions. Year-over-year stat 4: Last season, the Bucks were literally the worst defensive rebounding team in the NBA. Now they have the second-best defensive rebounding rate in the league, up to 75.7 percent from 70.9. That's crazy! It all starts with Giannis, who is pulling down more than twice as many boards as any of his teammates. Although he gets a lot more attention for his ridiculous dunks and his scoring stats, Giannis has suddenly become one of the best rebounders in the NBA, ranking fifth in the league in defensive rebound rate. But everyone in the Bucks' rotation is a competent rebounder, and their improved defense is ensuring there are more missed shots available that need collecting. The Bucks haven't just gotten better, they are suddenly a championship contender. This is the most impactful coaching change since Steve Kerr replaced Mark Jackson with the Golden State Warriors in 2014. Five years later, Bucks fans are hoping for a similar finish. This is all a key reminder of one of the most important things in basketball: coaching matters.